Karthigai deepam special Nel pori Urundai is a yummy Urundais made of Nel poris. 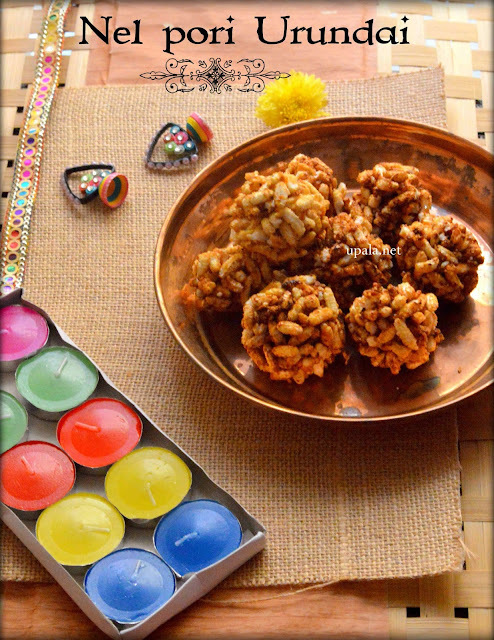 For Karthigai, Nel pori or Aval pori Urudais are made as neivedhyam. 1) Carefully remove all the Husk (Nel part) from the pori, measure it and keep it ready. 2) Add Roasted Peanuts to Pori and mix well. You can use store bought unsalted peanuts or prepare at home by dry roasting the raw peanuts and rubbing the skin away. 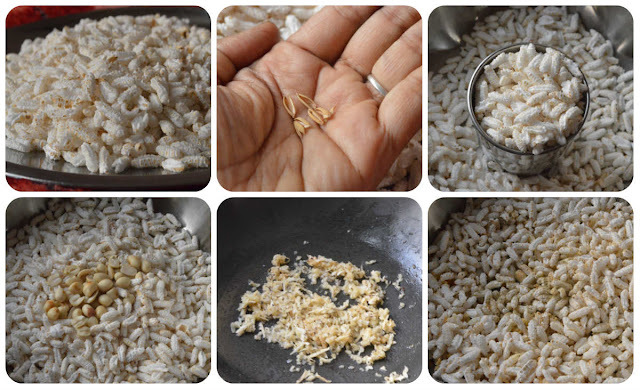 3) Add few drops of Ghee and add the grated copparai (dry coconut) and fry till nice aroma arises. 4) Transfer the pori and Peanuts mixture to a greased plate. Now add this roasted dry coconut and mix well. 6) Strain it to remove any impurities. Wash the kadai and add the syrub again and leave it to boil in medium flame. 7) Mean time keep a small bowl of water ready to check the consistency. 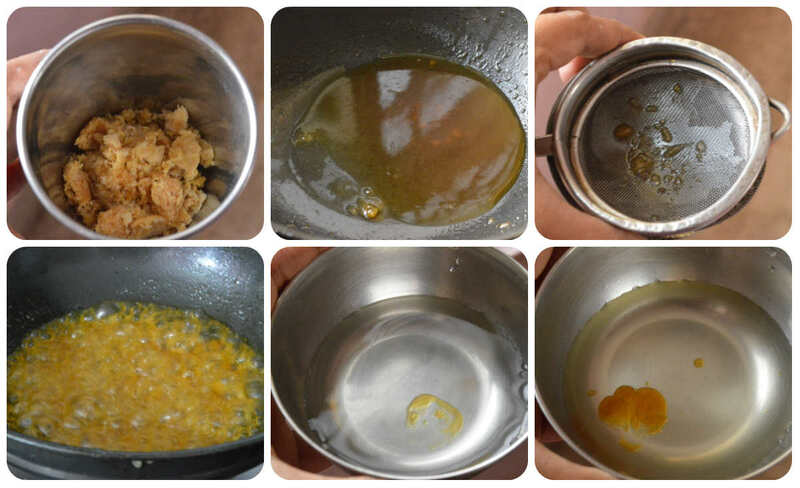 8) After Jaggery turns to a syrub cocnsisteny, drop few syrup in a cup of water. Jaggery should not get dissolved and it should form a soft ball when you try to roll it. This is the correct consistency so switch off the flame now, add Cardamom powder and mix well. In the below pic, I have shown a stage ahead where syrub dissolves in water. 9) Pour this syrup on top of pori in circular way and mix well. You can use wooden spatula or backside of a ladle to mix it. Allow it to cool for few minutes so that the mixture is not hot, but warm enough to make balls. 10) Grease your palm with ghee and start making balls. First make a rough ball then press it firmly to make tight ball so that it will not break. 3) If you don't want to add peanuts, you can skip them. 4) Instead or dried coconut, you can also add fresh ones. If you are adding fresh ones, chop them as small bits and them fry in ghee. 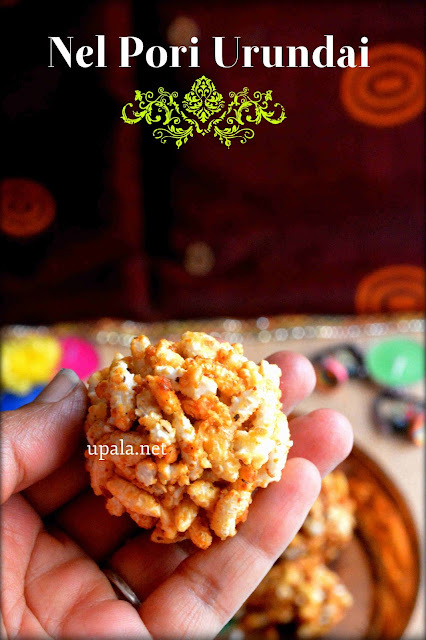 5) I have added the dried coconut and peanuts to pori, some might prefer to add it to Jaggery syrub for even mixing, you can choose the one that suits you. 6) Colour of Nel pori Urundais will differ according to the Jaggery that you use. I always prefer using dark coloured jaggery as it is healthier comparing to light ones. You can also use organic jaggery in same measure.